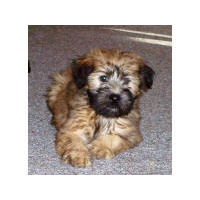 • Soft Coated Wheaten Terrier dog breeders are listed below alphabetically by State / city. 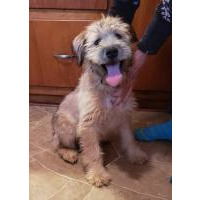 • Click on underlined words to find Soft Coated Wheaten Terrier puppies for sale. 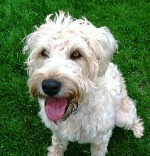 • Please tell the Soft Coated Wheaten Terrier breeders with puppies for sale that you found them on BreedersClub.net. The gentle wave of the silky coated Soft Coated Wheaten Terrier is one of the foremost physical characteristics of this happy breed. Originating in Ireland, it became an all-purpose farm dog, valuable in rooting out vermin, hunting and as a watchdog. AKC classifies this medium size breed in the Terrier Group. Our puppies are raised in our home with our crazy family. Kid tested, pre-spoiled. Providing healthy, happy, sweet pups to loving homes. AKC, health and beauty guaranteed, check out our pups on Animal Planet. Beyond cute puppies, well socialized and loved. I have been breeding for many years and take pride in my work with these wonderful dogs. I still love my puppies and give them lots of tender loving care having been breeding dogs for over 37 years. They are raised in a country enviroment in an enviromentally controlled kennel also with lots of room to go outside and run and play. Vaccines and worming will be up-date and they are all micro-chipped. They are all AKC or APRI registered and come with a 1 year health guarantee against genetic defects. I do ship them in the US. Puppies are all well socialized and make great companions for someone of any age. This breed directory page features Soft Coated Wheaten Terrier dog breeders with puppies and/or adult dogs for sale. Once you purchase your new found friend, you will want to provide it the best in pet health care. Be sure to visit our online discount pet supplies catalog and order NuVet Plus™ to keep your puppy and adult dogs in top condition. The discount catalog also features collars, leashes, carriers, general pet care products and much more. BreedersClub.net does not pre-screen the Soft Coated Wheaten Terrier dog breeders who advertise their puppies and dogs for sale in the BreedersClub.net dog breeder directory and in the classified ads. We require all advertisers to agree to our advertising terms. You should ask the Soft Coated Wheaten Terrier dog breeders you talk with for references from past buyers and veterinarians.